An age old devotional technique called Lectio Divina is gaining popularity again here in the 21st Century. Its growing popularity has made it the subject of lay and clergy studies, retreats, and literature, not only within Roman Catholicism but also in wider Protestantism including the Lutheran church. 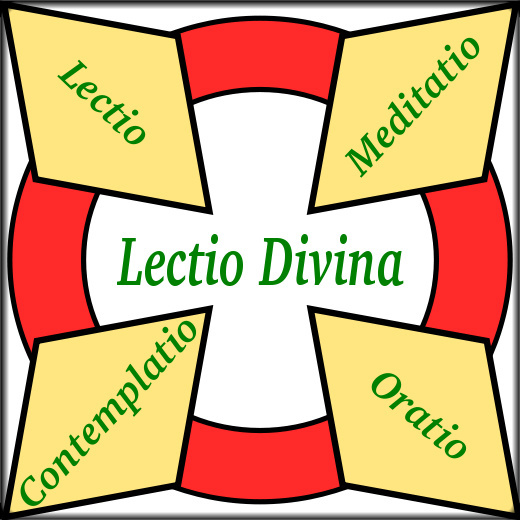 But what, exactly, is Lectio Divina and does it have a place within confessional Lutheranism? Lectio Divina is “divine reading” or “holy reading.” In its most basic form Lectio Divina is simply a technique for learning, meditating upon, and praying the Holy Scriptures. Various other definitions shed light upon the contemplative aspect that is most usually thought of as the goal of Lectio Divina. Lectio Divina… represents an early monastic technique of prayer which continues in practice though less widely, intended to achieve communion with God as well as providing special spiritual insights and peace from that experience. It is a way of praying with Scripture that calls one to study, ponder, listen and, finally, pray from God’s Word (Wikipedia). [Lectio Divina is] a slow, contemplative praying of the Scriptures which enables the Bible, the Word of God, to become a means of union with God (Dysinger). Benedict (480-543) extolled the value of “divine reading” in his Rule, making it a part of the daily ritual of monks in the Benedictine Order. Benedict envisaged his monks making about three hours a day available for personal lectio. He sees reading as one of the sources of spiritual energy, something that puts us into contact with grace and thus makes possible an enhanced level of fervor and unselfishness in daily living. It is clear that what Benedict has in mind is a very existential, life-related reading and not just mindless paging through any volume that comes to hand (Casey, 5). He makes extensive mention of the specific times, during each season of the church year, which are to be devoted to reading. Throughout the year he has at least two hours a day set aside for such reading (Benedict). Guigo II (1140-1193) was the first to systematize Lectio Divina into four steps or moments: reading, meditation, prayer, and contemplation. Sometime around 1150 he wrote his famousScala Claustralium, “The Monk’s Ladder.” In this writing uses the image of a ladder, reminiscent of Jacob’s ladder (Gen. 28) stretching from earth into heaven. This spiritual ladder is the means by which people “can climb from earth to heaven. It is a marvelously tall ladder, but with just four rungs, the one end standing on the ground, the other thrilling into the clouds and showing the climber heavenly secrets. Understand now what the four staves of this ladder are, each in turn.Reading. Lesson, is busily looking on Holy Scripture with all one’s will and wit. Meditation is a studious insearching with the mind to know what was before concealed through desiring proper skill. Prayer is a devout desiring of the heart to get what is good and avoid what is evil. Contemplation is the lifting up of the heart to God tasting somewhat of the heavenly sweetness and savour. Readingseeks, meditation finds, prayer asks, contemplation feels. The first degree is for beginners, the second for those profiting from it, the third for those who are devout, the fourth for those who are holy and blessed of God (Guigo). Guigo understands the four moments as a progression whereby one ultimately achieves contemplative union with God. He “affirms that simple dedication to God’s word, if carried to its logical conclusion, will conduct us to the lofty zones of contemplative intimacy with God. Thus it can be said that the ultimate goal of lectio divina is contemplation” (Casey, 59). Most understand the goal ofLectio Divina to be contemplation. That is to say, Lectio Divina is radically different from the kind of reading that we commonly engage in today. “One does not engage in Lectio Divina to acquire disinterested, intellectual knowledge. The intent of Lectio Divina is to make the reading of Scripture a prayer, to create a two way street for God and us” (Hagan). This is a spiritual reading that has as its chief characteristic an attitude of surrender to the word of God rather than the restless attempt to “get something” out of the text. The gratuity of Lectio Divina is different from the utility of study. Study endeavors to master the word,Lectio Divina surrenders and yields before it. Lectio Divina also differs from spiritual reading. The last can have as its end the acquisition of knowledge, the formulation of convictions or the stimulus for generous self-giving. The aim of the former is union with God in faith and love (Olivera). The four moments in Lectio Divina are to be seen as a progression. “What begins as reading becomes reflection or meditation; this leads to prayer and ultimately to contemplative union with God. The Latin terms used traditionally arelectio >meditatio >oratio >contemplatio” (Casey, 57). However, this progression is by no means a rigid “method” of prayer intended to be mechanically performed in one session. Neither is it a progression in the chronological sense. Sometimes the steps of the ladder are not chronologically connected. The prayer latent in meditation on Scripture is released unpredictably later when engaged in an entirely different activity. Some people combine reading, reflection, and prayer in a single ‘exercise’; others separate them in time and space. Many experience a delayed reaction. The impact of their lectio may strike months later. There is a lot of flexibility here that takes seriously different characters, different vocations, different opportunities, and the changing seasons of life (Casey, 59). The selection of reading material is very important inLectio Divina. “The earliest interpretations, and some current ones, see Lectio Divina limited exclusively to Holy Scripture” (Hagan). This is the most conservative position. Most modern practitioners would include other Christian writings. For the purposes of this paper, however, we will limit our discussion to the application of Lection Divina in the reading of Holy Scripture. It is also important to set a definite time for reading each and every day. Lectio Divina requires a time commitment each day from as little as a half hour to three or four hours a day. “Saint Benedict insists that the monk’s day includes definite times for reading. This is to say that such periods are known in advance they are not subject to whim…” (Casey, 23). Location is also important. Lectio Divina should take place in an area that is free from distractions. It also helps if the location has some kind of spiritual significance. Engaging in Lectio Divina should not be taken lightly. Commitment is key. “Spasmodic periods of a few minutes of spiritual reading may be of very positive value, but it is notLectio Divina. Lectio Divina as a formal discipline contemplates reading an entire book from beginning to end. Not at one sitting, but from beginning to end” (Hagan). The importance of this fact will be discussed later. It is also important to prepare the heart and mind. Modern practitioners of Lectio Divina stress the importance of engaging in “transitional activity” prior to reading in order to achieve the proper state of mind. Deep breathing, proper posture, and prayer prior toLectio Divina helps to give the reader focus helps the reader prepare for the encounter with God. Now that we have a general idea of what is involved in Lectio Divina let’s take a closer look at what takes place in each moment. Casey shows that behind the four moments of Lectio Divina lies the ancient teaching that there are multiple “senses” of Holy Scripture. Each sense is apprehended with a different faculty of human consciousness. The Four Moments of Lectio Divina (Casey, 57). Lectio engages the literal sense of Holy Scripture by use of the human intellect in order to understand the “historical” meaning of the text. This moment of Lectio Divina is characterized by study of the text. This may range from a mere reading of the selection multiple times to full blown exegetical study. Of key importance is the reading of complete texts rather than mere selections of texts. This helps to avoid misinterpretation. As one appliesLectio Divina to Holy Scripture this means reading whole books of the Bible. However, there is an aspect of this kind of complete reading that may be unfamiliar to our western mindset. Lectio Divina is not reading in the sense that our society has educated us to understand reading. Our western culture has taught us to consider reading as a purely lineal progression. We start on page 1 and proceed consecutively to ‘the end.’ Lectio Divina does in fact begin at the beginning and end at the end, but it presumes much wandering in between. Repetition is critical to Lectio Divina. Back and forth, up and down, savoring and balancing what is presently being read with what was recently read (Casey, 7). Another aspect of properlectio is an attitude of passive, silent receptivity. One is to become quiet during the reading in order to hear the voice of God. Lectio is reverential listening; listening both in a spirit of silence and of awe. We are listening for the still, small voice of God that will speak to us personally – not loudly, but intimately. In Lectio we read slowly, attentively, gently listening to hear a word or phrase that is God’s word for us this day” (Dysinger). A sense of expectation accompanies this receptive attitude. The Bible was written for salvation, therefore, we approach the text expecting to hear from God. However, we also recognize that God works in ways that we often do not expect. “What we sometimes forget is that this gift of salvation often runs counter to our own perceptions and expectations. The disposition that makes us capable of receiving salvation includes a willingness to be guided and to be changed” (Casey, 6). Submission is an important aspect ofLectio Divina. We are to approach the reading defenseless and ready to be changed and influenced. “We open ourselves to the text, we approach it in a spirit of faith and obedience, ready to perceive in what we read the word of God, the will of God, the action of God coming to save us.… We approach our reading as a disciple comes to a master: receptive, docile, willing to be changed” (Casey, 6). The lectio inLectio Divina lays the groundwork for the three moments which follow and yet it is only the beginning. “The literal meaning of the text is always the point of departure: the letter reveals the deeds and presents the persons, history is the foundation. The Spirit takes us beyond the letter, our theological life opens the door of meaning to us” (Olivera). Meditatio naturally flows from this first moment. Meditatio engages the Allegorical sense of Holy Scripture by use of the human memory in order to contextualize the meaning of the biblical text. In this moment human memory is used to discover Christ and the Church within and behind the biblical text in order to build faith. In its most basic sensemeditatio could be described as reflection and application. “We must take in the word – that is, memorize it – and while gently repeating it to ourselves, allow it to interact with our thoughts, our hopes, our memories, our desires” (Dysinger). The individual engages the biblical text in a new way by beginning to focus on a word or words that are of particular import. These words are repeated multiple times in order to commit them to memory. In the process the memory is used to call forth prior knowledge and experiences. The individual applies the text to himself as he begins to see himself within the context of Christ’s passion and as a member of the Church. Meditation is not to be confused with exegesis. Rather, it is an intensely personal reading of Holy Scripture with application to one’s own life. “To meditate is to chew and ruminate, for it is to: repeat, reflect, remember, interpret, penetrate… One who thus meditates on the Word is transformed according to the Word and becomes a mediator of the Word. When the text speaks to your heart, you have reached and received a precious fruit of meditation” (Olivera). This personal application of scripture inmeditatio serves two purposes. It effects both moral and experiential change. Memory is more than the ability to recall information. In the traditional sense it involves living in the presence of what is ‘remembered,’ just as mindfulness of a loved one may accompany all our activities. This is what Jesus meant when he spoke about ‘abiding’ or ‘remaining’ in his word (John 8:31; 15:7). To live in the presence of God alters our behavior and also effects a qualitative change in our experience. It is a dynamic element in ongoing conversion.” (Casey, 72). Oratio engages the Tropological or behavioral sense of scripture by use of the human conscience as the individual begins to live out the meaning of the text. The first expression of this is prayer. Oratio may simply be described as praying the text, using the words of the text itself to form the words or theme of one’s own prayer. It has also been described as opening one’s heart to God or even as conversation with God. “Prayer understood both as dialogue with God, that is, as loving conversation with the One who has invited us into His embrace; and as consecration, prayer as the priestly offering to God of parts of ourselves that we have not previously believed God wants” (Dysinger). The application of the text to oneself inmeditatio reveals our lowly sinful condition and creates in us a desire for a clean heart that we might know God. In this situation the heart itself is enflamed and led to pray for these things. In the midst of such prayer God grants contemplatio. What does God then, whose help is ever upon the righteous and our ear at our prayer? He doesn’t wait until the prayer is fully ended, but he pierces in the midst of the burning desire of that thirsty soul, and with a secret balm of heavenly sweetness softens the soul and comforts it, and makes it be so overcome with delight and joy that it forgets all earthly things for that hour, and he makes it to lose itself in wonder, as if it were dead from knowing ourself. And as in fleshly works we are so overcome that we lose the guidance of reason and so become all fleshly, right so in the ladder of contemplation our fleshly stirrings are so cancelled out that the flesh does not win over the spirit but is become all spiritual” (Guigo). What is contemplation? It is a change in the consciousness marked by two elements. On the one hand, there is a recession from ordinary sensate and intellectual awareness and all the concerns and programs that depend upon it. At the same time, more subtly, it is being possessed by the reality and mystery of God. Having emptied oneself in imitation of Christ (Philippians 2:7), one is filled with the fullness of God. ‘Of his fullness we have all received, grace for grace’ (John 1:16). The endowments of Christ become ours – in particular his relationship with the Father. In graced living Christ becomes the doer of our actions; in contemplation we become the subject of Christ’s prayer. There is a mysterious interpenetration of subjectivity in the realm of supernatural existence.” (Casey, 39)To contemplate is to take silent delight in theTemplewhich is Risen Christ. To contemplate is to encounter the Word, beyond words. To contemplate is to live in the Risen One, rooted in the now of this earth, reaching out to the beyond of the heavens. Contemplation is vision. The contemplative sees the resurrection in the cross, life in death, the Risen One in the Crucified. Contemplation is the thirst caused by the seeming absence or the satiety of mutual presence. The contemplative is at a loss for words, simply because he knows (Olivera). Contemplation is, therefore, the final goal. Incontemplatio the individual finally makes actual contact with the divine by ultimately transcending the text itself. “He who has revealed truth engraven in the innermost depths of his heart, does not depend on the sacred text and is for others a living Bible” (Olivera). John Kleinig has shown that Luther’s life in the monastery most certainly exposed him to the practice ofLectio Divina. This “pattern of meditation and prayer” was none other thanLectio Divina. Luther’s reformation discovery of the Gospel led him, finally, to reject this brand of spirituality. Oswald Bayer shows how Luther’s “reformation discovery” led him to a new understanding of Language. In his early years Luther dealt with the Word in terms of Augustinian and Stoic theology, namely, that “language is a system of signs that refer to objects or situations or of signs that express an emotion. In either case the sign is – as a statement or as an expression – not the reality itself” (Bayer, 76). In the case of holy absolution, for instance, the word of absolution was understood to be a declaration of that which has already happened in heaven. The absolution, in this case, is not the reality itself, rather, the words signify or point to a reality that already exists. Luther’s theological breakthrough was his discovery that the word of God is the reality in itself. “That the linguistic sign is itself the reality, that it represents not an absent but a present reality, was Luther’s great hermeneutical discovery, his ‘Reformation Discovery’ in the strict sense” (Bayer). Luther had discovered that the word “does what it says” and “says what it does” (Bayer). It is clear that Luther’s fully developed understanding of the word would have conflicted with the basic premise of Lectio Divina. Kleinig proposes that Luther’s Oratio, Meditatio, Tentatio was his corrective toLectio Divina. In contrast to this rather manipulative method, Luther proposed an evangelical pattern of spirituality as reception rather than self-promotion. This involved three things: prayer (oratio), meditation (meditation), and temptation (tentatio). All three revolved around ongoing, faithful attention to God’s word” (Kleinig, 258). It has already been demonstrated that the ultimate goal ofLectio Divina is contemplation whereby one comes into an experiential encounter God. In this encounter one is enabled to transcend the text of scripture and achieve direct communion with the divine. The fundamental presupposition behind this is the idea that the word is merely a sign. The word is a mediator between God and man which, while certainly important and useful, is not the thing in itself. True, actual, communication with God cannot take place until one, by prayer and meditation, is finally by God’s grace, enabled to go beyond the text to establish mystical communion with God. It is for this reason that, in Lectio Divina the word can only be the point of the departure or necessary beginning which leads ultimately to the true goal of true communion with God on a purely spiritual level. In Luther’s Oratio, Meditatio, Tentatio there is no room forContemplatio. The direct encounter with God happens in the word itself. The word does not merely signify God’s speaking to us. The word is, in fact, God speaking to us. There is no reality to be sought beyond the word of God. Therefore if you want to be certain what God in heaven thinks of you, and whether He is gracious to you, you must not seclude yourself, retire into some nook, and brood about it or seek the answer in your works or in your contemplation—all this you must banish from your heart, and you must give ear solely to the words of this Christ; for everything is revealed in Him (Luther, AE 24:257).One thing, and only one thing, is necessary for Christian life, righteousness, and freedom. That one thing is the most holy Word of God, the gospel of Christ, as Christ says, John 11[:25], “I am the resurrection and the life; he who believes in me, though he die, yet shall he live”; and John 8[:36] (Luther, AE 31:345). The order in oratio, meditatio, tentatio is important. In contrast to Lectio Divina which sees the word as a means to an end, Luther’s list continually leads one back to the word. Oratio, meditatio, tentatio “describe the life of faith as a cycle that begins with prayer for the gift of the Holy Spirit, concentrates on the reception of the Holy Spirit through meditation on God’s word, and results in spiritual attack. This in turn leads a person back to further prayer and intensified meditation” (Kleinig, 258). For Luther everything is focused on the word. Prayer does not stand above the text as a more spiritual exercise divorced from the word. Luther does not see the believer seeking for something beyond and above the text in prayer. Rather, true prayer (oratio) directs believers toward the Scriptures. In prayer the believer asks for understanding and steadfastness as he approaches God’s word. Furthermore, the very words of scripture form the language of prayer itself. Luther also completely redefinesmeditatio. Whereas in Lectio Divina meditation is focused on the human memory and its ability to make the text personal through the recollection of past events, Luther’s understanding of meditation focuses on God’s word. For Luther, meditation is simply the continual study of scripture. God’s word is not a mere sign that needs to be internalized in order to be heard properly, it is the very voice of God that comes with power both to kill and make alive. Finally, Luther replacesLectio Divina’scontemplatio withtentatio. The goal is no longer subjective, experiential contemplation with God. Rather, in his addition of tentatio he refocuses our attention on the word as the goal. Tentatio (sufferings and temptation) is a form of spiritual attack which drives the believer away from the internalized self to the external word. Tentatio is not a goal. It is not the highest rung on a spiritual ladder to heaven. It is God’s way of turning self-seeking men back to the word and therefore back to himself. We must applaud Lectio Divina for its high respect for the word of God and for it’s many helpful suggestions on how to approach it’s study. However, we have seen that, in the final analysis,Lectio Divina merely pays lip service to the word in favor of its much loftier goal, namely, contemplation. It was finally unable to stand up to Luther’s full blown theology of the word and was therefore rejected by him in favor of a new approach that kept the word as the focal point and goal. Lectio Divina’s growth in popularity seems to be in line with certain trends within pop-Christianity that focus on subjectivism and experientialism. Luther’s oratio, meditatio, tentatio is deserving of a much greater hearing in our Lutheran churches as a truly faithful substitution and corrective for the kind of spirituality being promoted in the church today. Bayer, Oswald, “Luther as Interpreter of Holy Scripture,”TheCambridge Companion to Martin Luther, Edited by Donald K. McKim,CambridgeUniversity Press, 2003. Casey, Michael, Sacred Reading: The Ancient Art of Lectio Divina,Liguori,MO, Ligouri/Triumph Publications, 1996. Dysinger, Luke Fr., “Accepting The Embrace of God: The Ancient Art of Lectio Divina,” St. Andrew’s Abbey [website]; http://www.valyermo.com/Id-art.html; Internet; accessed 22 December 2006. Guigo II, “The Ladder of Four Rungs,”U.M.I.L.T.A [website]; http://www.umilta.net/ladder; Internet; accessed 22 December 2006. Kleinig, John, “Meditation”Logia (Eastertide, 2001), 45-50. Kleinig, John, “Oratio, Meditatio, Tentatio: What Makes a Theologian?”Concordia Theological Quarterly; Vol. 66:3 (July, 2002), 255-267. Luther, M. (1999, c1961). Vol. 24: Luther’s works, vol. 24 : Sermons on the Gospel of St. John: Chapters 14-16 (J. J. Pelikan, H. C. Oswald & H. T. Lehmann, Ed.). Luther’s Works.Saint Louis: Concordia Publishing House. Luther, M. (1999, c1957). Vol. 31: Luther’s works, vol. 31 : Career of the Reformer I (J. J. Pelikan, H. C. Oswald & H. T. Lehmann, Ed.). Luther’s Works.Philadelphia: Fortress Press. Luther, M. (1999, c1960). Vol. 34: Luther’s works, vol. 34 : Career of the Reformer IV (J. J. Pelikan, H. C. Oswald & H. T. Lehmann, Ed.). Luther’s Works.Philadelphia: Fortress Press. O’Hagan, John, “Lectio Divina,”Monastery of the Ascension [website]; http://www.idahomonks.org/sect810.htm; Internet; accessed 22 December 2006. Olivera, Bernardo, “Bernardo Olivera on Lectio Divina,”The Order of St. Benedict [website]; http://www.osb.org/lectio/olivera.html; Internet; accessed 22 December 2006. Republished with permission. The original appears at Sound Witness.org right here.